I have a lot to give thanks for when it comes to delicious things in my life. When most people hear that I’m a lactose intolerant and gluten-free vegetarian, I often wonder if they think I eat grass. I don’t…for the record. Although I do eat a lot of veggies that are green…but not grass. Never grass. DAIRY-FREE AND GLUTEN-FREE COOKIES ‘N CREAM COCONUT MILK FROZEN DESSERT. Pardon the unnecessary, but highly needed caps lock abuse. First of all, as a Celiac do you realize that I never…NEVER…get to eat anything that in any way, shape, or form resembles ice cream that has the words “cookie,” or “dough” in it? It’s true. Those have become relics of my past. Ice cream that I used to know. Favorites of mine, left to melt away in my memory…of their flavors and their deliciousness. Thanks to the good people at So Delicious Dairy Free…that is no longer the case. Oh, you better believe the first pint I dove into was the Gluten-Free Cookie Dough. Growing up, whenever we got ice cream from the store or went to our local ice cream parlor (The Dairy Barn! ), I was a cookie dough ice cream girl. That was what I wanted. 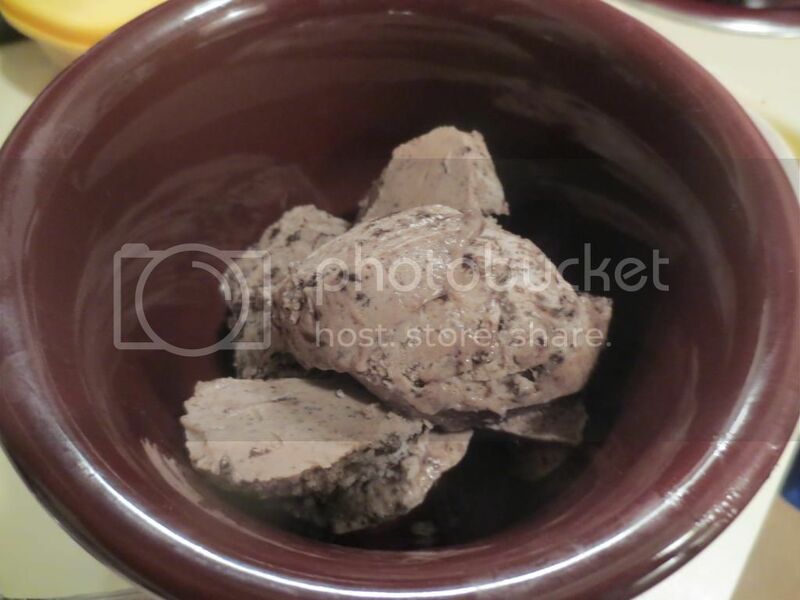 Oddly enough, I never ate raw cookie dough…but put it in ice cream and…oh…yeah. Magic. We all know I about died when I got to eat the So Delicious variety, having gone YEARS now since having a taste of one of my favorite flavors. And if you are just tuning in, click on the link above and read all about that moment! But…we come back to the present now…and tonight…tonight it was time to give the other childhood favorite a shot. Another flavor of ice cream I always have to just stare at and dream about eating. But not now…not again. Not when So Delicious comes through and delivers their So Delicious Dairy Free Gluten-Free Cookies ‘N Cream Coconut Milk Ice Cream. So, while my roomie and I were feasting on dinner, I set the pint out to thaw a little. I find that non-dairy frozen desserts often need about 5-10 minutes of sitting on the counter to make scooping easier. Trust me. Do it. It means you won’t have to go to battle with your pint of delicious goodness. The last thing you want to do is go to battle with dessert. That’s just not…human. After we finished dinner and doing the dishes, I went to get out the ice cream scooper and serve up the latest flavor of non-dairy frozen goodness from a company that prides itself on their products that they call themselves So Delicious! That’s bold. And I love them for that! I scooped us each up a serving and settled in to finish watching a Food Network show of our choosing tonight. I was practically on the edge of my seat…anticipating that first taste. I dipped my spoon into my bowl, scooped up a bit of the ice cream…and BAM…everything I missed about Cookies ‘N Cream ice cream came flooding back to me. I might have teared up a little. Amazing. First of all, So Delicious does not skimp on the fillings. You are getting chunks of gluten-free sandwich cookies in this ice cream. You are getting this rich and luxurious base made form coconut milk that doesn’t overpower. The vanilla is a nice compliment to all the flavors. And those cookies…OH MY GOD…those cookies…they are the things that dreams are made of. Especially for someone like me…who has had to ignore anything with the word “cookie” in it for so long. Dreams do come true and So Delicious truly makes it…delicious. Each bite had that rich sweetness to it…plus the chunkiness of the cookies. You get that crunch with the creamy texture of the dessert itself. Oh…yes. If heaven were a pint of ice cream…I was devouring it at that very moment. A new favorite. It’s also really good over a warm gluten-free brownie with hot fudge drizzled over it. I’m just throwing that out there. I might have done that too. So, what exactly goes into a pint of the So Delicious Dairy Free Gluten-Free Cookies ‘N Cream Coconut Milk Frozen Dessert? I’m about to tell you! This ice cream is made from organic coconut milk, organic dried cane syrup, gluten-free creme cookies, chicory root extract, natural flavor, carob bean gum, and guar gum. Not only is this free of dairy and gluten, but it is also cholesterol free, vegan, non-GMO, and kosher. And…I know it’s a treat…it’s dessert…but I always hit up those nutrition facts. 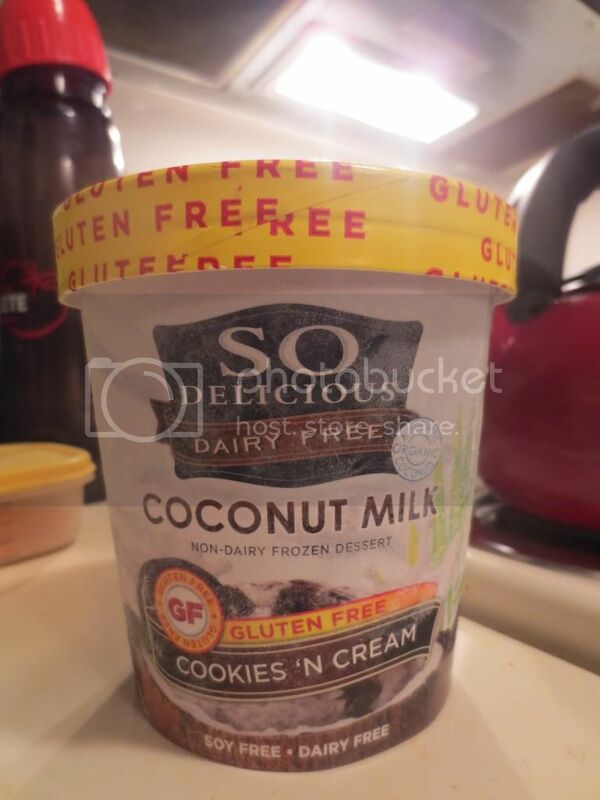 A serving of the So Delicious Dairy Free Gluten-Free Cookies ‘N Cream Coconut Milk Frozen Dessert is 1/2 cup. In this serving, you will be consuming 160 calories and 7 grams of fat. Keep in mind, some of that fat count comes from that nutritious coconut milk! You will also be taking in 50 mg sodium and 16 grams of sugar. Yep…it’s high in sugar…but it’s an ice cream treat. You sort of expect that. And, finally, you will be provided with 7 grams of filling fiber and 1 gram of protein. Not too shabby for a frozen dessert, right? RIGHT! Yeah…my love for So Delicious continues to grow every time I get to try one of their products. Stay tuned…because there are more frozen treats from So Delicious in my freezer just waiting for me to pick them next to try. It’s a good thing that ice cream is one of my most favorite things in life. And, now, here’s one I can safely consume! Oh, So Delicious…how I love you and your magical pints of frozen goodness. This entry was posted in Brownies, Chocolate, Cookies, Dessert, Food, Frozen, Gluten-Free, Ice Cream, Products, Review, Snacks, Sweet Stuff, Vegan, Vegetarian by The Celiathlete. Bookmark the permalink.